South Korea has managed to keep out the lure of fast food and the influence of the Western diet in favor of its traditional way of eating. The country boasts a low obesity rate of 10 percent, while in the U.S., obesity rates for adults are at 34 percent. Understanding the differences between the Korean and American diets may help you replace some of your unhealthy food habits. As in other Asian countries, the basis of the South Korean diet is rice. In fact, the traditional Korean greeting "Have you eaten rice today?" is similar to saying "How are you?" in the United States. The diet also emphasizes vegetables, fish, soy and fermented vegetables known as kimchi. Korean cuisine is known for its barbecued meats, and while South Koreans enjoy their barbecue, they eat it sparingly. Korean's also use a minimal amount of fat in their cooking, preferring to steam or boil vegetables and roast or broil meats, and use small amounts of sesame oil when stir-frying. The typical American diet is quite different from the Korean diet. It is high in sugar and fat and loaded with processed foods. According to the 2010 Dietary Guidelines for Americans, the top source of calories for adults in the United States is grain-based desserts, which include cookies, cakes and doughnuts. Americans also eat a lot of bread and chicken -- both fried and baked -- and processed foods such as pizza, tacos and pasta dishes. Soda, energy drinks and sports drinks are also a top source of calories in the American diet. The Korean diet is high in carbs and low in fat. If you want to eat more like a Korean, replace your processed carbs and high-fat foods with rice and vegetables. 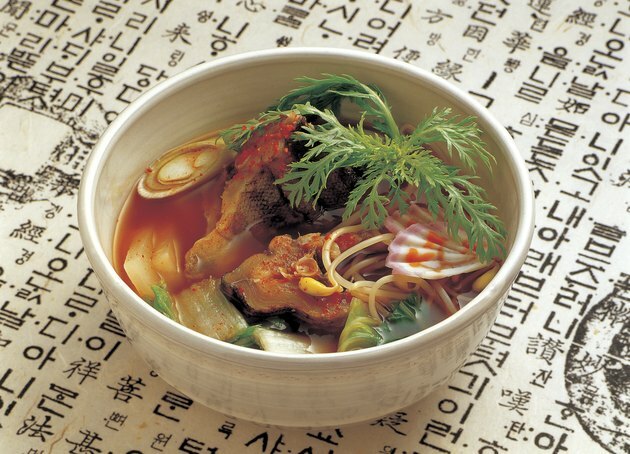 Koreans eat rice, kimchi, soup, vegetables and roasted meat or fish for breakfast. Instead of eggs and bacon with a side of doughnuts for breakfast, try a bowl of brown rice with some steamed vegetables and broiled fish. This meal makes a healthy lunch or dinner, too. If you can't quite see yourself eating kimchi three times a day, you can make changes to your American diet to improve its nutritional quality, which in turn helps improve your health and weight. You can start by making fruits and vegetables the focus of all your meals, filling half your plate with them. Also, replace your refined processed grains with whole grains. Eat more seafood. Eating 8 ounces of omega-3 rich fish a week, such as salmon, lowers your risk of heart disease. Does Red Meat Raise Your Blood Pressure?